A classic black forest cake combines layers of rich chocolate cake with whipped cream and cherries. My version uses strawberries instead of cherries which is very common in most black forest cakes. I suppose cherries are very hard to find, seasonal and quite expensive too. In a jug, whisk together oil, vanilla essence, milk, and eggs. Set aside. Sieve plain flour, cocoa powder, salt, baking powder and soda bicarbonate. Into the dry mixture add the sugar and whisk until combined. Pour the liquid in the jug into the dry ingredients and whisk until it forms a uniform batter. Grease a 9-inch pan and line the bottom with baking paper. Pour the batter into the pan and even it out using a spatula. Bake in a preheated oven at 175°C for 35 minutes or until a skewer inserted comes out clean. Let the cake cool down in the pan for 10 minutes then remove on a wire rack and let cool completely. Cut the cake in half lengthwise (feel free to cut into 3 layers if you like). To prevent the cake from crumbling too much when trimming and cutting the layers, pop it into the freezer for 30 minutes. Prepare the strawberry filling by boiling strawberries, sugar and water for 5 minutes. Let cool completely before using. Spoon some of the strawberry syrup onto the bottom layer of the cake to make it moist. Using a piping bag, pipe an even layer of whipped cream. You can use an offset spatula to flatten it. Spoon some strawberries onto the cream and press down the top layer of the cake. 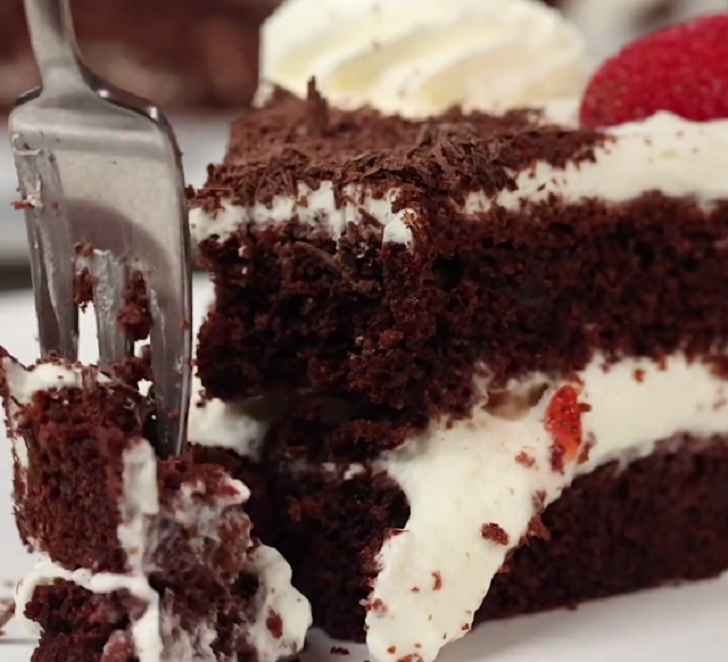 Add a few dollops of whipped cream on the cake and using an offset spatula, smoothen it out in back and forth motions. Ice the sides as well. Pop into the freezer to set for 5-10 minutes. Using the palm of your hand, stick the chocolate shavings onto the sides of the cake. Pipe a few rosettes around the cake and add strawberry halves for garnishing. Sprinkle the remaining chocolate shavings over the middle.